Fresh, fruity, festive, and doggone delicious! 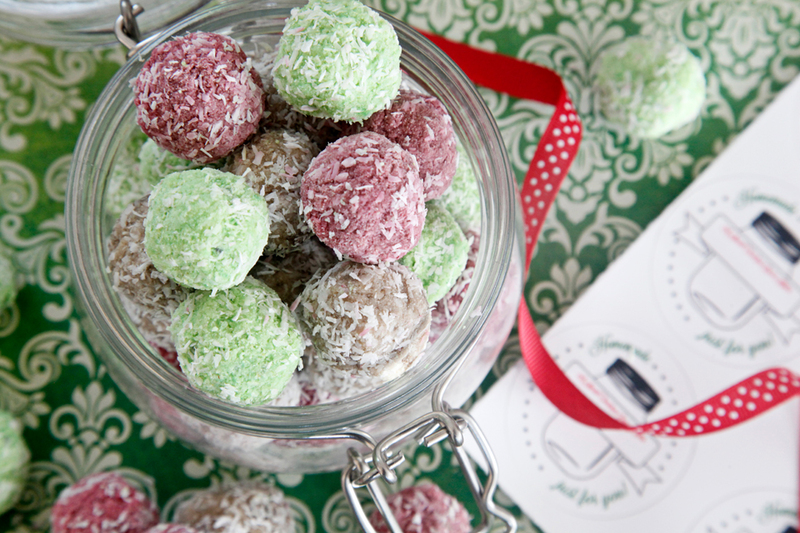 These truffle treats are very easy to make and pretty doggone healthy too. Mix and match with your pup's favourite fruity flavours. Thoroughly mash the fruit/berries in a mixing bowl (or puree for a more uniform truffle texture), and stir in the coconut oil. Incrementally add coconut flour. Add a little extra coconut flour or water if needed to adjust consistency to a nice sticky dough - precise measures can vary depending on the liquid in your fruit. The coconut oil will firm-up when chilled, so this dough may feel slightly oily/wet and crumbly when warm. Press into small bite-sized balls, coat in coconut, and refrigerate until firm. 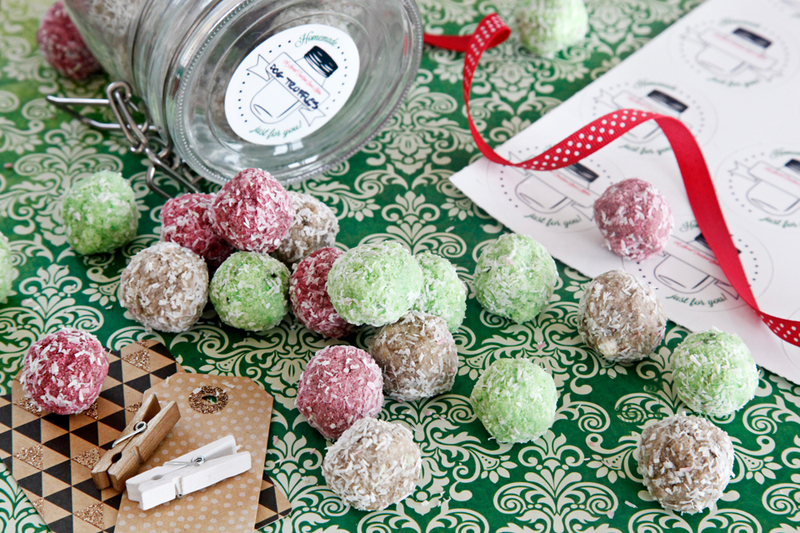 These truffle treats should be kept refrigerated. They can be frozen for longer storage, but remember to defrost them in the fridge so that you don't accidentally heat them up and melt them. :) Our dogs have also happy eaten a few straight from frozen in hot weather! Fruit/berries can be used fresh or thawed from frozen. We often include ground flaxseed in our truffles, but skipped it for the pictured treats because it creates a strong speckling in the truffle dough and we didn't want to distract from the Christmas colours. If you'd like to add some for healthy goodness, you can use 1 tbsp per 1/4 cup of wet pureed fruit without having a significant impact on the other ingredient quantities. For easy distribution, mix it with the puree/oil before the coconut flour. If you are prepping your holiday baking/gifts and would like to fancy things up with some wash-and-wear labels, check out Kidecals, like the pawesome labels throughout this post. I've been playing with them for a few months now, and they're great! They hold up incredible well in the dishwasher, but come off no-muss no-fuss whenever you'd like to remove them. You can customise them with full printing (like our emergency tags) or leave some space for individual customisation, which is great if you want to order lots or need some flexibility. I've experimented a little and they work great with fine-point Sharpies for semi-permanent changes and with dry erase markers for very temporary text. Handy for keeping unsuspecting humans from snacking on tasty looking dog treats...hehe! They're also a classy way to identify your dishes/platters to ensure their safe return from pot-luck gatherings and tons of other uses. If you'd like to try Kidecals for yourself (or give them as a gift), you can use coupon code summersavings (don't be too jealous, but it's summertime down here) to save a tidy 15% on your purchase. Disclosure: Discounted Kidecals products were provided for my use on a no-obligation basis. Opinions provided are my own and are an honest representation of my user experience. We have a Christmas post for you every weekday between now and the start of our offline holidays, with toys, decorations, treats, and more so stay tuned! We'll see you again tomorrow for our final pre-holiday post, furfriends! The ASPCA's current website guidance is to be cautious, which is what we would recommend for any/all new foods and note at the bottom of any treat post that we share. Our dogs haven't experienced any digestive issues with small amounts of coconut in occasional treats or coconut oil, and they really seem to like the taste/smell, but like any food, it's not for everyone. Coconut milk, flesh and coconut oils contain fats which may cause digestive issues for some dogs (gas, upset tummy, diarrhea). On the flip side, coconut also has lots of healthy properties. Thanks for the recipe. I make all my dogs treats as they are grainfree due to allergies. I am always on the hunt for different recipes to make. You're very welcome! :) Most of our recipe ideas are either grain-free or can be easily adapted to grain-free by substitution.